The Easter bank holiday weekend is often the first weekend that many of us get down and dirty with the gardening for the year. Whether you’re hitting the garden centre this Easter weekend or are ready to enjoy some time relaxing in your outdoor space, you’ll no doubt have work to do first. No matter how much time you have, there is always enough time to get something done in the garden. So whether you have five minutes, five hours or five days, there are garden projects to suit the time you have available. Although you may not believe it, a single colour garden creates just as bold a statement as a multicoloured, carefully coordinated planting scheme. Although it’s a brave move, it can create a stunning landscape to look out on. And, if like us, you are addicted to plant-buying, it does at least make choosing your next purchase that bit easier! There’s a one-colour scheme garden to suit everyone’s style. Just take a look at these colours and see which one will suit your needs. Revealed: Is Snow a worry for our Gardens? Brrr…it’s been a little chilly of late, hasn’t it?! And whilst it can be lovely to look at those unblemished stretches of white, snow can be worrying for our gardens. But should we be worried? And is there anything we can do to protect our gardens during a snowy spell? Did you know that your vegetable growing doesn’t have to be confined to the summer months? There are certain vegetables which you can grow year-round, or specifically in the winter months, and which will thrive during the cold spells. Here are some of our favourites. Frost is a serious threat to plants, even evergreens. It causes damage either by freezing the soil and preventing the plant from getting the nutrients it needs, or freezing the water in the plant’s cells, making it go limp and brown. Which is why it’s important to take steps to protect your most valuable plants where possible. So here is some advice to help you do just that. The winter months can be harsh on our gardens, but even harsher on the wildlife that rely on our gardens’ ecosystems. While we’re warm and cosy indoors, why not spare a thought for our furry friends outside in our gardens, and do as much as you can to give them food and shelter over the winter months? There are plenty of ways that you can both encourage wildlife into your garden and create a safe haven for creatures great and small over the winter months. Herbs are a firm favourite for many gardeners, simply because they require very little looking after to produce some tasty ingredients for your meals. They’re not just popular in summer, either; they are great for less enthusiastic gardeners during the summer months, and they’re also simple to look after in the autumn months, too. Look after your garden now, and it will repay you when spring and summer return. Here’s how to get your garden cold weather ready. Have you Considered These Great Reasons to add a Patio? If you have a small garden, decking is an excellent choice. Many people choose to pave a small garden, or lay loose stones throughout, but decking is often a better option. Why? Well, it gives a small garden a much more natural look and feel. What is a Planting Plan and Why do you Need One? If you’re a landscape gardener, you’ll know all about planting plans. However, if you’re an amateur gardener, you’ll be forgiven for wondering what a planting plan is, or why you could possibly need one! A planting plan is a technical drawing used by landscape gardeners to plan how best to use the space available in terms of shrubs, flowers and foliage. It therefore ensures that your garden is bursting with colour and interest year round! With the UK recently experiencing a heatwave of proportions last seen in the 1970s, our poor old gardens may be suffering a little from lack of water. As much as we want to be outside during the summer months, it can be frustrating to see our lawns turning yellow as the dry spell continues. Most lawns will bounce back once the autumn months arrive. Keeping it well maintained during the summer months, however, is key. With fashion, and even interior design to a certain extent, when trends change, it’s easy to update your look, or that of your home. But when it comes to your garden design? There are easy ways to incorporate the latest in garden design trends so as to change the overall look and feel of your garden. Brick is a great material to use within your garden landscape design. It’s a lovely, warm material which is surprisingly versatile despite being durable. But how can you incorporate it into your garden design without it sticking out like a sore thumb in your green oasis? Here’s how to work with bricks within your garden design at all levels. If you have a long, thin garden, you may well find it a bit of a nuisance. The end of the garden is a long way from the house, making it difficult to mow the lawn, run power to, or, if the sun sets at that end of the garden, transport food and beverages from your house to a seating area in the sun. But a long, thin garden can also be a blessing in disguise, especially when landscaped professionally. With a little forward planning, your narrow garden can really work for you. If a garden isn’t assessed regularly, it can easily become overgrown and / or in need of repair. That’s why it’s crucial to regularly carry out a stocktake of your garden to see if anything needs repairing or keeping in check. By doing this regularly, you’ll avoid expensive renovations further down the line. When designing a garden, it’s important to know that your design is a realistic prospect and can be built in a safe and functional manner. This is the beauty of choosing a garden designer who can not only design your perfect garden, but also create it in real life, too. What can you do if your garden is liable to flooding? There are several ways that you can manage the problem to ensure that your garden isn’t spoilt by excess water. An English Country Garden is many people’s ideal outdoor space. There’s something about the mature planting which is idyllic, pretty and soft which appeals to many of us. Regardless of how big or small our outdoor space is, it’s a look which can be achieved with a little bit of planning and a following a few simple tips. Any outdoor space is precious outdoor space. Yet many people wrongly believe that if you have a courtyard garden, there’s not much you can do with it. Creativity is the key to a beautiful courtyard garden, and you can actually go quite quirky in most small spaces and still get away with an area of beauty. Ready to get creative with your courtyard? Why not try these ideas for (small) size? There are a variety of ways that you can add lighting to your garden, and by carefully considering your options, you’ll be able to highlight certain features and really make the most of your outdoor space by night. There’s a trend at the moment towards creating an outdoor cooking area.It doesn’t need to be fancy, either. You can make your outdoor cooking area as simple or sophisticated as you want or need it to be. Here are a few ways to aid your al fresco dining, to a greater or lesser extent, with a dedicated outdoor cooking area. If you’re thinking of adding value to your home, you should definitely consider having your garden professionally landscaped. Is it possible to marry a children’s play area with a grown up landscaped garden? Yes, is the answer! And no matter what your tastes are, there are a variety of ideas to make a garden suitable for several generations. During the winter months, it’s easy to forget about garden maintenance. It definitely takes more effort to get outside and make sure everything’s well in our outdoor space when it’s cold and grey, that’s for sure! But actually, ensuring that our outside space is well maintained during the winter months will make things easier when the warmer weather comes round. Plastic Decking: the way Forward for Winter-Proof Decking! In the past, when installing garden decking, there’s always been the worry that come winter time, the wood will be slippery and possibly rotten. But nowadays, there’s a great new choice for decking which is made from a composite of plastic. This means it’s a great option for winter proof decking! Check Your Fences for the Winter! With the onset of winter comes the necessity of securing your fences so that they can handle the blustery seasonal weather. Although most of your garden duties can be relaxed over this period, it is important to make sure your garden and home are secure by examining your fencing to ensure it can withstand wind and storms. It’s at this time of year, as the days get shorter and the chill in the air gets fiercer, that you need to think about winter proofing your garden. Having an understanding of the lay of your garden is useful as is knowing which plants that you’ve lovingly tended can and can’t take frost. A little knowledge is essential for getting your garden through these cold months ahead. Decking has become a one stop solution in the garden for smoothing out bumpy ground, creating a stunning feature and making gardens much more manageable. With belts being collectively tightened around the land and more and more people making alterations to their homes rather than moving, decking has recently experienced another surge of popularity. A decked area is a fantastic and effective way of creating extra living space outdoors, without incurring major costs and all in a relatively short time too. Everyone knows what a perfect lawn should look like: a smooth stretch of lush, green grass. So why are so many lawns nothing more than unattractive areas of rough grass and weeds with dry, bare patches in some places and soggy, moss-covered patches in others? Summer is the time when your garden should be looking its best and you should be able to enjoy more time outdoors. A good gardener can always find something that needs doing, but look for labour saving ways of doing essential jobs and concentrate on reaping the rewards of the work you did earlier in the year. The early part of the year can be both exciting and frustrating for gardeners. There are signs of new life stirring everywhere but bad weather often makes working outdoors unpleasant or even impossible. There’s no point in trying to fight against nature. The best plan is to do what you can outside on mild days, and reserve indoor gardening tasks for when it’s cold or wet. Despite living in a country that is renowned for its wet weather, the UK nearly always ironically experiences a hosepipe ban or water shortage warnings during the summer months. With water shortages it is most often the keen gardeners who are affected and are urged to reduce their water usage in order to conserve stocks in the local area. In such instances, what can the keen gardener do that will save water but also keep the garden looking nice and prevent plants from wilting away? Most people recognise that ‘going green' and trying to lessen our impact on the natural environment has many benefits, but there are still some misconceptions about what exactly is involved in eco friendly gardening. Does it require more work and expense than ordinary gardening? Will you have to abandon your favourite flowers or watch helplessly as slugs and aphids invade your vegetable patch? The answer to all these questions is, No! If you are new to gardening, deciding which gardening tools to buy can be surprisingly difficult. You might know you want a garden fork but how can you tell which fork to choose from the dozens on offer in your local garden centre or DIY store? Should you be guided by price, or brand name? Which is best, stainless steel or ordinary steel? Wide or narrow head? Wooden or metal shaft? Why does spring always take us by surprise? After what seems to have been a very long winter, the garden is suddenly filled with new life and growth. Whether you’re a keen gardener or someone who prefers low-maintenance options, who can resist the lure of spring sunshine? Now is the time to make the most of your outdoor space! For a Stunning Garden – Just Add Water! Is something missing from your garden? Is it lacking vitality and interest? Imagine how different it would be if you introduced a pond, stream or fountain of some kind. A well-designed water feature provides that elusive wow factor that turns an ordinary garden into a very special place. It may be the shortest month of the year, but February can often surprise us with a wide range of weather conditions. There might be snow and frost one week, followed by a few mild, sunny days, before bitterly cold winds blow in rain and plunging temperatures again. Any work you want to do in the garden has to be guided by the weather. Walls and fences are most commonly used to define and protect the boundaries of a garden, but they are also useful and decorative in many other situations. Here are just five reasons why you might want to include them in your garden design. Once you start thinking about it, you will probably find a lot more! A healthy lawn not only looks attractive and provides a focal point for your garden; it also offers a multitude of wonderful advantages for health and the environment. How can maintaining a well kept lawn benefit our health and the environment? Have you checked your garden fences recently? As they form the background to your garden, and are often hidden behind plants, it’s all too easy to forget about them, until there is a problem that is. To preserve your privacy, security and peace of mind you should make sure they are always in good condition. Many people walk up and down their garden paths without paying much attention to them – unless they notice a wobbly slab or weeds growing through the cracks. 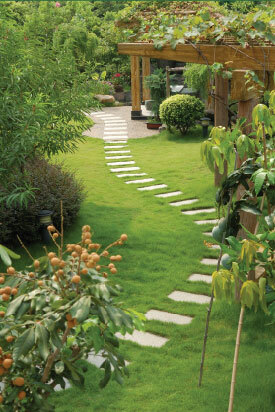 If your paths are past their best, or no longer suit the way you use your garden, why not consider some new ones? The cold, dark days of winter force even the keenest gardeners to retreat indoors, but there are still lots of gardening jobs to be done from the comfort of your fireside. Here are some of them! Faced with hiring a landscape gardener, many people don’t know where to turn. There are many to choose from, and lots of them claim to be ‘garden experts’. To help customers choose the right company, Essex garden landscape experts D&G Garden World have published some guidance. Garden decking is exceptionally versatile; can be used to overcome issues that make landscaping difficult, to enhance the features of a garden, to add practicality or to extend a house into a garden. Essex landscape gardeners and decking experts D&G Garden World have recently put together a list of the major benefits of garden decking. Anyone considering having any work done on their gardens over the winter are in for a pleasant surprise!